A Practical Guide from AJ6 Engineering. Jaguar never intended that their V12 power unit should be fueled other than by electronic injection but the proposed AE Brico system (also under development for the Aston Martin DB6 and the Ferrari Dino) was cancelled at a very late stage. This left Jaguar with no option other than to hurriedly cobble something together using the CD carburetors which had already helped the XK engine comply with the emerging emissions requirements of the time in the USA. The resulting quad setup served to get the V12 into production in the S3 E Type and then for the first XJ12 saloon but Jaguar knew that something better would be required for the forthcoming XJS. The popular Bosch D Jetronic EFI system shared many features with the Brico system so it made sense to ask Lucas to develop an adaptation of it in time for the XJS launch in 1975. In due course Lucas developed their P Digital system specifically for the V12 and this reached production in 1980 for the rare 10:1 compression engine. As the 6CU, evolving a little further for the HE, this became the basis for all the remaining EFI variants of 16CU, 26CU and finally 36CU for the 6 litre XJS. The manifolding and hardware of all of these can essentially be traced back to the Brico prototypes of around 1970. The 16CU is a sound, reliable, and relatively simple system that can be used with or without catalysts (i.e. Lambda feedback) and with Lucas or Marelli ignition. It is therefore a very good basis to use for updating a carburetor V12. For most people the non-catalyst option and Lucas Constant Energy ignition will be most appropriate. However there are so many detail differences from carburetor engine (manifolds, water rails, wiring, pipework, etc) that any attempt to offer a complete conversion kit would work out more expensive than most people would be prepared to pay. The practical solution is to acquire an old HE XJS or XJ12 and use it as a donor car for all the EFI and ignition parts. Our guide explains how this can be done and leads the reader through the various parts and their functions by use of diagrams for identification rather than meaningless part numbers. The detailed explanations, wiring diagrams and fuel flow layouts will also help anyone wanting to develop a thorough understanding of how these systems work. A major advantage of using the HE systems is that the car will not become a one-off that nobody understands – virtually everything used will be familiar to anyone with Jaguar V12 experience and is fully dealt with in existing Jaguar workshop manuals. We can reprogram a 16CU control unit for the earlier flat head V12 and we can also provide performance upgrades that will improve the car still further. A converted car will therefore not become difficult to service or repair, and the value should actually be improved – apart from in the eyes of the most stubborn ‘originality diehard’. Add to that a considerable improvement in performance, drivability, and fuel efficiency and it all becomes a very attractive proposition. Were it to become mandatory it would even be possible to convert the car to run with modern three way catalysts and Lambda feedback. The guide has been updated with extra guidance about engine swaps to later types (HE, 6.0, etc.) and transmissions. It also explains why the final X305 V12 is not an ideal engine for this purpose. The guide is available only from us as a PDF download. It is listed in the publications section of our price list. History, Stromberg, SU & Weber carbs, advantages of EFI. EFI options, ignition, HE V12 as donor car. 3. ELECTRONIC FUEL INJECTION – A Basic Explanation. How it all works – understanding the essentials. 4. THE INLET MANIFOLDS AND ATTACHMENTS. Inlet manifolds, throttles, air filter boxes. How it is arranged and how it works. 6. THE DISTRIBUTOR AND IGNITION SYSTEM. Distributor, centrifugal and vacuum advance, amplifier, coil types, timing. 7. THE FUEL RAIL, INJECTORS AND BREATHER PIPES. Pipework, pressure regulators and injectors. Engine breather system. 8. WATER RAILS, THERMOSTATS, AUXILIARY AIR VALVE. Coolant system from the heads to the thermostats, sensors, idle air control valve. 9. THE FUEL PUMP AND FILTER. Getting the fuel out of the tank and through the pump and filter. ECU types, wiring diagrams, component locations, inertia switch. 11. SWAPPING TO A LATER ENGINE TYPE. Installation of an HE or 6 litre engine. Improvements worth doing at the same time to make the car really special. ECU, induction and exhaust system upgrades. 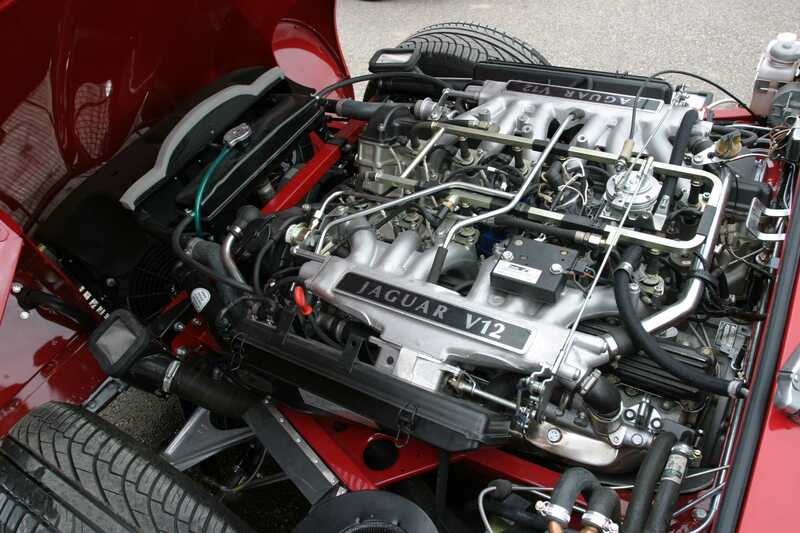 AJ6 Engineering provides products to improve the responsiveness and performance of your modern classic Jaguar (E Type, XJS, XJ6, XJ12 & early V8s). We produce uprated induction systems for the V12, a range of exhaust systems and we reprogram electronic control units, which we also test and repair. We can also provide versions of our upgrades suitable for racing, with the emphasis shifted towards top-end power rather than the mid-range torque that is more useful for a road car.